The patented SPECTRALIS TruTrack Active Eye Tracking technology corrects possible displacements by reacquiring OCT images at the correct retinal location in real-time. OCTA algorithms vary in their ability to create contrast between static tissue and flow. The SPECTRALIS OCTA algorithm utilizes a full-spectrum probabilistic approach to generate OCTA images with an almost binary, high-contrast appearance. SPECTRALIS OCTA offers flexible scan patterns with variable scan densities and fields, selectable depending on the pathology of interest. For example: A 30°x15° scan pattern can provide a relatively large overview of the retinal and choroidal circulation whereas a high resolution scan of a smaller field can facilitate a more detailed evaluation of vascular abnormalities at the capillary level. 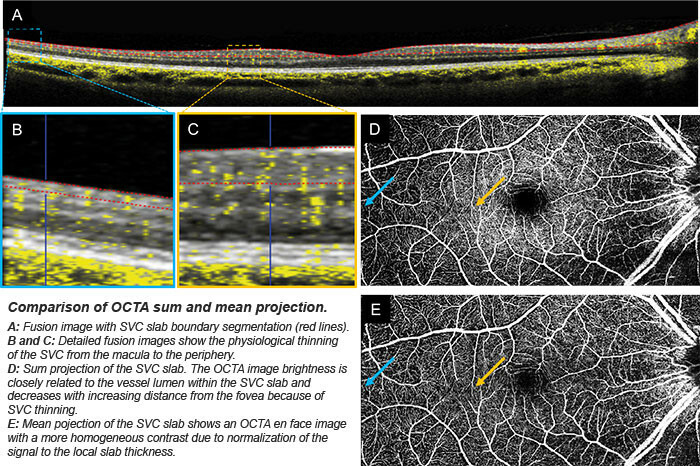 A fusion image superimposes the OCTA signal on the structural OCT section image offering a detailed and precise correlation between retinal microstructures and perfused vessels. Would you like to find out more about the latest OCTA developments, their clinical applications, and associated challenges?